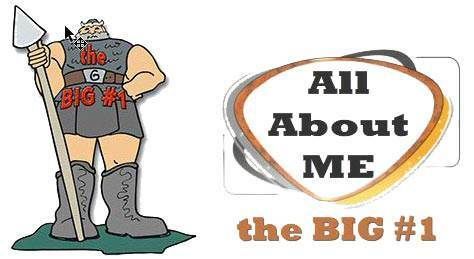 What Breaks Fellowship | Lesson 14 in series "All About Me"
It is so easy to see things in others but most difficult to see ourselves. Let's ask the Holy Spirit to show us each time we wrong someone else. Am I always late for events? Do I pull my share of the load in any particular situation? Do I pay my bills on time? In other words, am I a contributor to a right spirit or am I one who fosters a wrong spirit, just by my actions? One of the great stories in the Bible regarding relationships is the story of David and Jonathan on the one hand and the story of Saul and David on the other. 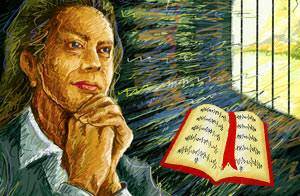 When we think of not wronging each other, Jonathan's story is a classic. How did he do it? It was a God thing. Jonathan knew that God had things to accomplish in the nation and his role was to fit into God’s plan. His was a key role and the reward awaiting him is yet to be seen. He is a classic as far as the Spirit-filled life is concerned. 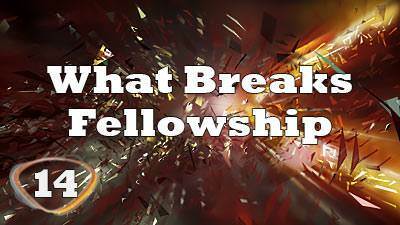 Fellowship breaks down when people are in rivalry with each other. Who are you in rivalry with? Why are you in rivalry with that person? It will eventually spoil your fellowship and you should repent of it. 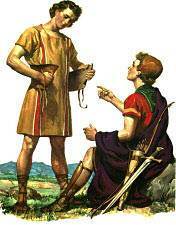 When we look at Saul and David we find that it is a story of Saul’s rivalry with David. How did this rivalry get started? Was it justified in the flesh? In the Spirit filled life? No. How did the sins of this rivalry grow? Saul threw spears and he was mad. Breaking fellowship by being suspicious. Fellowship breaks down as well if we are suspicious of each other. Judging people's motives and attitudes before you have any proof will lead to many problems. We need to be discerning but not suspicious. 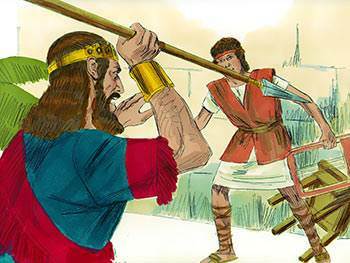 King Saul became suspicious of David when he heard the song in the streets. Mind games are an important part of the enemy’s strategy to defeat us. Romans 12:2 speaks of the renewing of our minds, which can happen through the study of God’s Word. Our objective should be to widen the circle of fellowship by preaching the cross and to keep the circle of fellowship by being right towards each other.